Macao’s new Portuguese-speaking Countries (PSCs) Food Products Exhibition Centre will multiply the business opportunities between Mainland China and Portuguese-speaking Countries, prominent figures in the world of commerce say. The Portuguese-speaking Countries Food Products Exhibition Centre opened on 31 March 2016, in Tap Seac Square business centre, commonly known as the Glass House. The exhibition centre occupies 390 square metres. 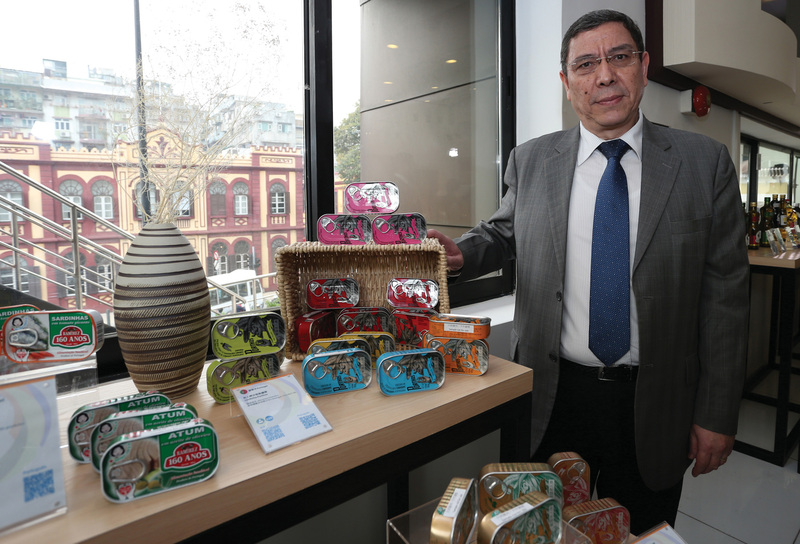 Appealing to people’s tastebuds is a great starting point for an entrepreneur setting up a new business or for an established business looking to expand its market, says General Manager of F. Rodrigues (Successors) Co. Ltd. Humberto Carlos Leitão Rodrigues. F. Rodrigues, established in 1916, has the exclusive rights to distribute several Portuguese products in the city. It also sells in Mainland China. The company is displaying various kinds of food and drink in the exhibition centre, including wine, olive oil and tinned food. The exhibition centre displays food made or supplied by enterprises in Angola, Brazil, Cape Verde, Guinea-Bissau, Mozambique, Portugal and East Timor – 60 in all. The products on display include organically grown food, snack food, tinned food, coffee and alcoholic drinks. “This is a one-of-a-kind centre, exclusively dedicated to products from Portuguese-speaking Countries. It’s another step towards creating a platform to promote products of Portuguese-speaking Countries in the Chinese market,” Mr Rodrigues says. The exhibition centre functions in tandem with a website, the Economic & Trade Co-operation and Human Resources Portal between China and Portuguese-speaking Countries (the Portal), www.platformchinaplp.mo. The Portal gives information about the products on display and can be used to buy the products. Mr Rodrigues applauds the setting-up of an online platform where suppliers and buyers, whether wholesaler or consumers, can interact and do business. Macao is setting itself up as a platform for China and Portuguese-speaking Countries to do business. The newly established Portuguese-speaking Countries Food Products Exhibition Centre is part of that endeavour. In 2013, the Vice Premier of the People’s Republic of China Wang Yang attended in Macao the “4th Ministerial Conference of the Forum for Economic and Trade Co-operation between China and Portuguese-speaking Countries (Macao)”. On that occasion, Vice Premier Wang clearly pointed out Mainland China’s support for Macao in the construction of the “Three Centres” – namely a commercial and trade service centre for small and medium enterprises (SMEs) between China and Portuguese-speaking Countries, a food product distribution centre for Portuguese-speaking Countries, and a centre for conventions and exhibitions for economic and trade co-operation between China and Portuguese-speaking Countries. Thus, the exhibition centre is a manifestation of what the government calls its “Three Centres” policy for forging stronger links between China and the Portuguese speaking Countries. 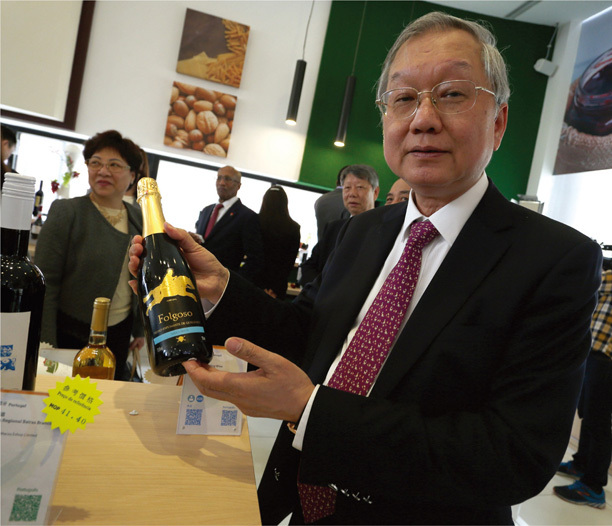 The President of the Macao Federal Commercial Association of Wine and Food Industries in Portuguesespeaking Countries and Regions, Sunny Ip Sio Man, says the exhibition centre is a milestone on the way to reaching the policy goal. Mr Ip owns Vang Kei Hong Trading Co. Ltd., a local importer and wholesaler of various sorts of goods. “From now on, products from Portuguese-speaking Countries will be displayed here for Chinese importers or distributors to check out and experience,” Mr Ip says. He expects the exhibition centre to connect producers in Portuguese-speaking Countries with distributors in China. Mr Ip says the online database of food products from Portuguese-speaking Countries already lets consumers and businesses reach and interact with importers. “The exhibition centre is even better, because people can experience what the products are like,” he says. IPIM’s President Jackson Chang says the Institute will constantly be developing the Portuguese-speaking Countries Food Products Exhibition Centre, bringing in more exhibitors. “We will continue to use several ways to strengthen the structure of the centre and effectively promote the role of Macao as a Commercial and Trade Co-operation Service Platform between China and Portuguese-speaking Countries, in order to create more business and co-operation opportunities for enterprises,” Mr Chang says. The Ambassador of Cape Verde to China Tânia Romualdo believes the exhibition centre could become a gateway to the Mainland Chinese market. “This is a very interesting initiative for Portuguese-speaking Countries, because it allows us to reach a very large market – which would be much more difficult for us to do on our own,” she says. Ms Romualdo expects the exhibition centre to grow as other exhibitors display more products. “Companies in Portuguese-speaking Countries are definitely interested in expanding their markets beyond their national borders, and this centre can help with that,” she says. 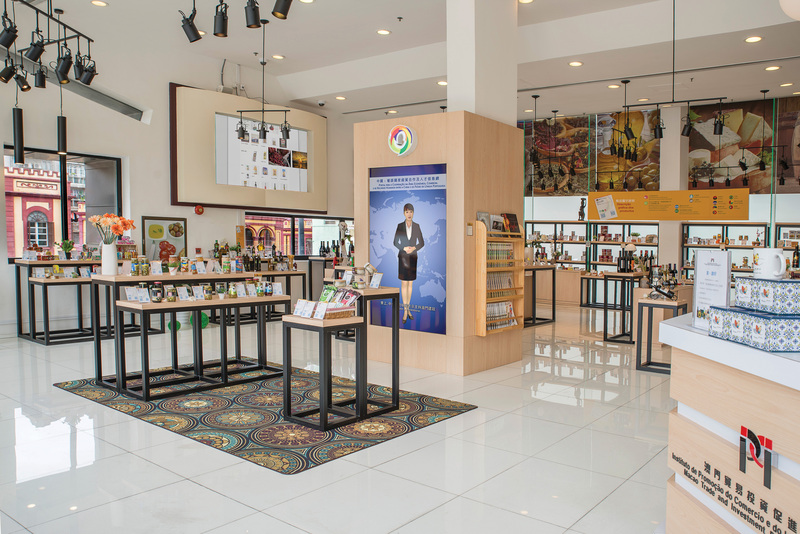 The Portuguese-speaking Countries Food Products Exhibition Centre provides comprehensive online and offline services to companies in Mainland China and Portuguese-speaking Countries, including Macao. It provides detailed information about products, their producers and suppliers. 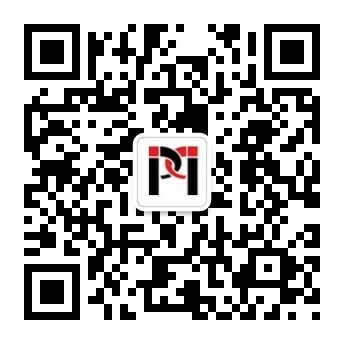 Each product displayed in the exhibition centre has a unique QR code, which directs customers to information about the product and its producer, contained in a database accessible through the Economic & Trade Co-operation and Human Resources Portal between China and Portuguese-speaking Countries. The products described in the database can be purchased online through a third-party shopping platform accessible in various languages. IPIM’s Executive Director Gloria Ung says the website allows businessto-business and business-to-consumer transactions. “We are trying to make searching for information about suppliers and producers in Portuguese-speaking Countries easier for local small and medium enterprises or Chinese companies,” Ms Ung says. “For some of the products that are ready to be sold direct to consumers, there are thirdparty online shopping sites where some of these smaller transactions can be made”. IPIM has agreements with three E-commerce companies – Macau Eshop Co Ltd, E Mall Retail Ltd and Vang Kei Hong Trading Co. Ltd. – to promote the sale of products on display in the exhibition centre. The arrangement allows products from Portuguese-speaking Countries to be sold direct to consumers. Macau Eshop is owned by HN Group Ltd., a company that focuses on importing and selling Portuguese products. 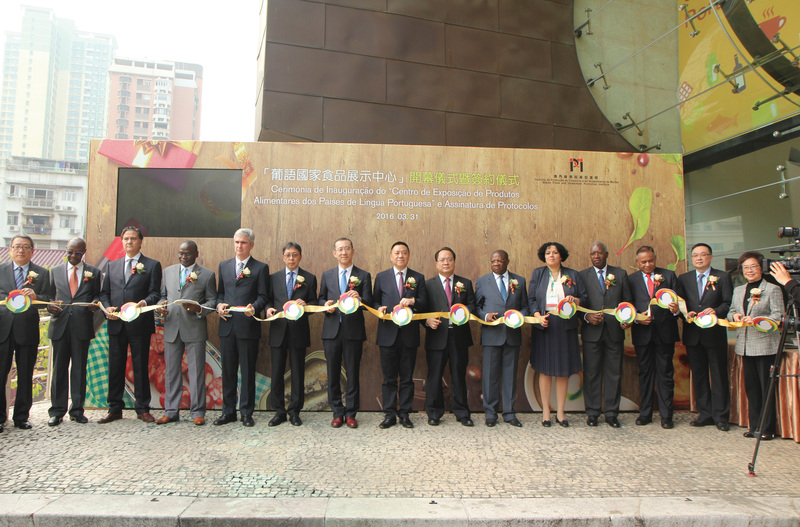 The opening of the Portuguese-speaking Countries Food Products Exhibition Centre is one measure taken to promote the sale of food from the Portuguese-speaking Countries to Chinese markets. On the day the exhibition centre opened, IPIM signed agreements with two business associations: the Macau Importers and Exporters Association and the Macao Federal Commercial Association of Wine and Food Industries in Portuguese-speaking Countries and Regions. The agreements are meant to allow further penetration of the Chinese market. The associations will have the task of setting up a Macao and Portuguese-speaking Countries Commodities Exhibition Centre and a Pavilion for Portuguese-speaking Countries in several Mainland Chinese cities including Chongqing, Guangdong, Hunan, Shanghai, and Zhejiang. Each outlet will provide exhibition space for displaying food from Portuguese speaking Countries. A third agreement, between IPIM and Macao CTS Hotel Management (International) Ltd., commits the company to providing space in four hotels and one restaurant it runs to display food products from Portuguese-speaking Countries.